After extracting the pure honey by lightly pressing it out, I was left with five wrung-out honeycombs that still had honey in it. I learned much later that beekeepers use a centrifuge to separate the honey. I suppose the centrifugal forces that press against the spongy honeycombs further squeeze out the honey and filter it. Anyway, I had the idea to liquefy the spongy mass of honeycombs and then strain out the remaining honey. To do this, I heated a small amount of water in a pan. I then dumped of what's left of the honeycombs in it. Everything seemed to have melted quickly. I then poured the entire honeycomb mixture into a plastic tray to cool. Once the honeycomb mixture started cooling, the yellow wax-like substance separated and formed on top. And it did that on its own. This yellow part is beeswax. The honeycomb structures are made from this substance. The texture and hardness of the newly formed beeswax was like that of the newly dripped wax from a candle. Although the beeswax hardened as it cooled, it wasn't brittle. I was able to pry and lift almost all of it. Show below is the beeswax, which molded into the shape of the tray. The beeswax is soft but doesn't droop. It is rather pliable and can be folded or rolled. What I did is to fold and roll it into a compact form that resembled a bar of soap. Honestly, I wasn't sure what to do with it but decided to store it away. 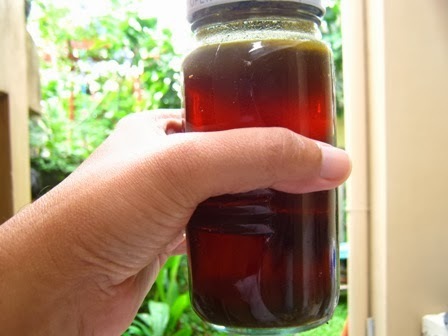 The liquefied honey mixture that passed through the strainer was poured into another glass jar. This filtered liquid mixture is shown below and held against the light. The residue that was filtered and remained inside the strainer was mostly debris from dead honeybees, bits of beeswax and other organic matter. I threw this away. See, a lush and thriving garden not only gives you flowers that you can appreciate and enjoy. Sometimes nature gives you a bonus - honey - with the help of hardworking honeybees.